Perhaps he can take credit for some gains, but his “motor voter” program is a disaster and ought to be shut until it is fixed. In September, the Department of Motor Vehicles admitted it made 23,000 erroneous registrations. Serious questions about the integrity of the program must be answered. Expanding access is worse than worthless without voting integrity. This is not a partisan issue. It’s about protecting the righteousness of our election system, which is a sacred responsibility in a democracy and one that rests with the Secretary of State. Although the DMV is a troubled department, Padilla must take ownership of Motor Voter’s problems. He sponsored the bill establishing the program in 2015, Assembly Bill 1461 by Assemblywoman Lorena Gonzalez-Fletcher, a San Diego Democrat. Under the bill, when a citizen obtains or renews a driver’s license or state ID card, the DMV must automatically transfer voter registration information to the Secretary of State’s office. The ACLU’s concerns were prescient. It doubted the DMV’s ability to properly handle and transfer the necessary personal data to the Secretary of State. The ACLU also pointed out that motor voter, as originally created on the federal level, envisioned an opt-in system, not the opt-out system California was putting in place. Huge difference. The problem with the opt-out program is it does not provide adequate protection against data errors. The newly registered voter receives a postcard in the mail stating they have been registered to vote. If they object, they need to notify the local registrar of voters to be removed from voter rolls. In the end, large numbers of non-citizens unwittingly are added to the state’s voter files, ironically putting themselves at risk of deportation. Apparently, he never has spent hours in a DMV line, as many Californians have done. The situation was so bad in September that Gov. Jerry Brown ordered an audit of the DMV. 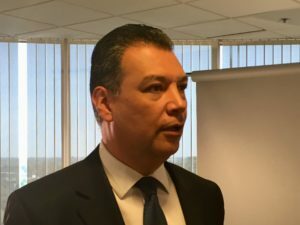 The ACLU said there were more than 3.3 million lawful permanent residents in California and that even a small margin of error could result in hundreds or more mistakenly added to the voter rolls. That scenario has now played out. Curiously, the bill was amended late in its legislative process with provisions protecting noncitizens from prosecution under state law, although not federal law. Another late change: cutting out a provision requiring the DMV to provide the Secretary of State with proof the newly registered person is a citizen eligible to vote. The final wording specifically said the DMV was not required to determine eligibility for voter registration and voting. Rather, the Secretary of State is solely responsible for determining eligibility. In other words, Padilla, as our Chief Elections Officer, is responsible for ensuring the integrity of our elections system, including the registration process. That’s not enough. A major embarrassment was bound to happen. The Motor Voter must be suspended until it’s fixed, and it’s Padilla responsibility to fix it. And legislators should quickly take up Senate Bill 57 by Senate Republican Leader Pat Bates, of Laguna Niguel, which would change Motor Voter to an opt-in system. Sen. John M.W. Moorlach is a Costa Mesa Republican representing the 37th Senate District, [email protected] He wrote this commentary for CALmatters.